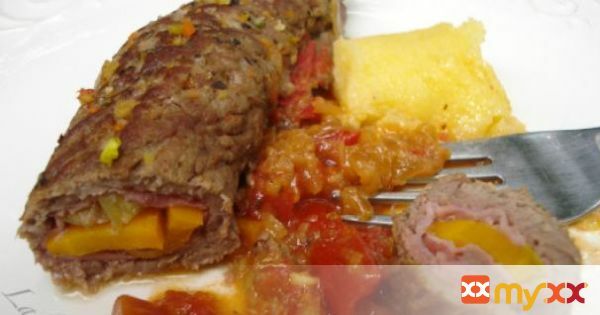 Tender, mouthwatering beef rolls with vegetable filling. 1. Beat the beef steaks lightly, season with salt and pepper. 2. On each steak place few pieces of bacon or cooked ham. 3. Arrange celery and carrot onto bacon. 4. Fold the steaks into rolls, secure them with metal or wooden toothpicks. 5. Heat olive oil in a deep pan, fry the rolls until they are golden brown on all sides. 6. Add onions, sauté briefly, then add the wine. Sauté for another 3-4 minutes until wine evaporates a little. 7. Add tomatoes, reduce flame and cover the pan, simmer for 30 minutes or until the meat is quite soft. 8. Before serving remove wooden or metal toothpicks from the rolls.